Please be sure to RSVP to attend this year’s banquet on Sat, April 27th at Ascension Lutheran Church. Cost to attend is only $5/person. Senior students attend for free – but must still RSVP so that we have an accurate headcount. Breakfast menu will include casseroles and other items. Donations for ingredients (and some helping hands to prepare and decorate on Friday night) are requested through this SignUp Genius: https://www.signupgenius.com/go/4090D48A9A72FA3FA7-breakfast? April 10 – nominations gathered. Candidates must accept their nomination by Monday. Any additional nominations must be made – and accepted – by Monday as well. April 17 – candidates will make some remarks about these three topics: 1) what makes them a good candidate for a troupe officer position, 2) what skills do they bring to the position, and 3) what is their long-term vision for next year’s troupe members. Thespian membership will cast their ballots in club. Election results will be posted to the blog by Monday, April 22nd. April 24 – We will gather ideas from the membership during club to gather ideas for next year’s activities. May 1st – club meeting. Everyone welcome. May 8th – Last club meeting for 2019-20. Everyone welcome. Volunteers are still needed to help in the lobby during performances of our upcoming show. Please visit this website to claim whatever spot(s) fit your schedule. District policy requires all adult volunteers to be on the district-approved list – forms can be found on the district website. Donations are also needed for the “theatre family dinners” during tech week, dress rehearsals and performance nights. Students in the cast, crew, and pit orchestra should plan to stay after school to prepare – and meals will be provided. But only if we are able to gather the necessary items. If everyone can pitch in a little bit, we’ll be able to take care of everyone! This is the link for donating items that will be sold at the concession stand. Thespian Festival – Nebraska, anyone? Where: University of Nebraska in the city of Lincoln. It is Johnny Carson’s alma mater, and they have 5 theatre spaces… it is the Big 10 university campus. Cost: Registration covers all activities, food and lodging for the festival – $840 for inducted Thespians. $870 for non-inducted Thespians. Lodging will be in the dormitories (2/room) and meals are provided in campus dining halls. Mrs. Mintzer and Mrs. Shellenberger have attended for several years. Mr. Matusek attended for the first time in 2018 – ask any of us questions if you are considering if you should attend. Registration nation-wide opens on February 1st – so if you are planning to go this summer, you must contact Mrs. Mintzer (and she will want to speak/meet with your parents) before January 25th. Seating for the mainstage performances is based on the order in which a troupe registers and pays for their festival attendance. Last year, the festival sold out (over 5000+) almost a month before the registration deadline – and over 110 troupes were turned away. Penn Manor WILL be registering on February 1st – so it is time to get details in order to finalize thi summer’s trip! If you have a student involved in this production – or if you are a community member or alumni who wants to support our theatre program – please join us for our upcoming meetings. They will last no more than one hour, and will begin at 6:30 pm in room 209 at PMHS. Keep an eye out in a future post for links to our SignUpGenius registrations for how you can donate your time, talents, or supplies needed. If you are not already on the district-approved list, please also become an official volunteer and register your clearances. Info is posted on the main PM district website. CAST MEMBERS: Monday through Thursday (all call) from 3:00 – 5:30. Mondays will be all-calls for dance (bring appropriate clothing/shoes). Tuesdays will be all-call vocals. Wednesdays and Thursdays for blocking. As a general rule, you will be doing something every day – consider these sessions “all-calls” when everyone should attend. BRING A WATER BOTTLE TO EVERY REHEARSAL! 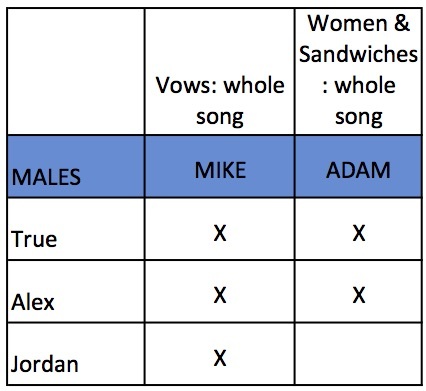 Wed, Jan 2nd – Vocals for Katherine/Ellie only. Thursday, Jan 3rd – EVERYONE. Monday, Jan 7th – begin everyday, for everyone. CREW MEMBERS: Please attend any work sessions to pitch in with each day’s projects. If you don’t want to use power tools, you can still help to measure, hold things in place, organize, paint, etc. You will need to log your hours on a regular basis throughout the production process – and we need your help in many areas. Helping hands and a willingness to learn is the primary requirement. Mondays – 3:00 – 5:00 – Costumes/ Make Up/ Props. Begins Jan 7th. Tuesdays and Thursdays – 5:30 -8:30 – Set Construction/ Sound/ Lighting. Begins Jan 8th. Saturdays – 9:00 – 1:00 – All call. Each week – starting on Jan 12th. 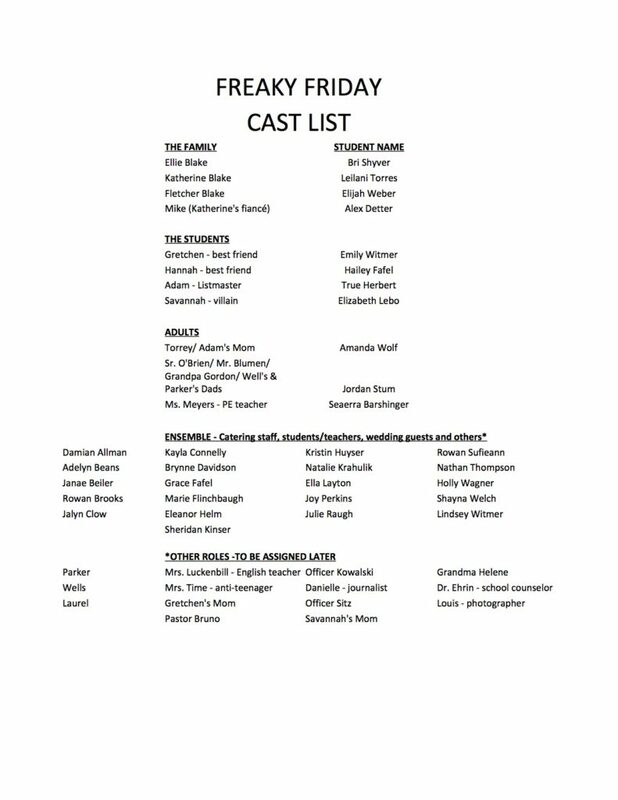 Thank you to everyone who auditioned – the final cast list is posted below. Please stop by Mr. Matusek’s office to initial by your name to indicate that you accept the role(s) offered. Our first read-through rehearsal will be on Thursday, December 20th from 3:00 – 5:00 pm in room 209. If you were not cast in the show, and would like to be a crew member, you must send an email to Mrs. Mintzer before the holiday break by December 21st to indicate your interest. We must compile a list of all participating students to begin checking academic eligibility, etc. Thank you to everyone who auditioned! 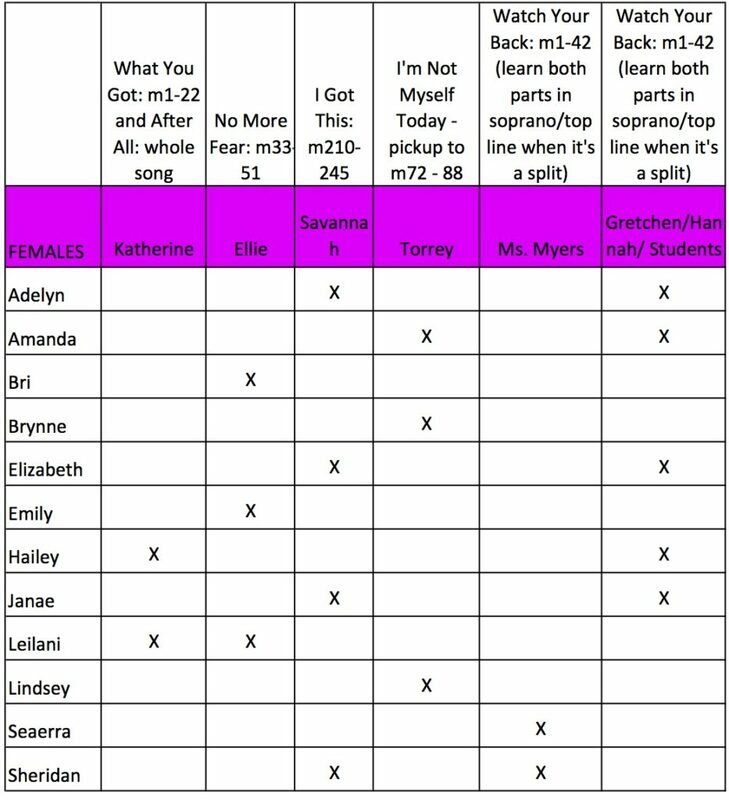 The call back info is below – these students will be given (or can stop by room 209 to pick up) a libretto script to prepare more songs for Thursday’s call back session. Please note the characters connected to your name – and the songs we’d like you to review before Thursday. Callbacks will be held from 4-6 in the auditorium. Just because your name does not appear on this list, does not mean that you do not have a chance to be in the cast. We will post an entire cast list after we complete the call back process. Information session – Monday, Dec 3rd from 3-4:00 in the auditorium. Meet new staff members, ask questions, etc. Dec 10th – 4:00-6:00 – ALL CALL (everyone interested in an onstage role). Dance auditions. Come dressed & prepared to move. No experience required – just a willingness to learn and do your best! Dec 10th – 6:00 – 8:00 – OPEN CALL – sign up for a time slot that suits your schedule. This is when you’ll sing a little, and read some scenes with other members of your group. Students will be in groups of 6-8 per 30 minute time slot. Dec 11th – 4:00 – 8:00 – OPEN CALL. Same as above. You only need to attend one open call session. Choose Dec 10-11 as your schedule allows. Dec 12th – a day off! Dec 13th – 4:00 – 8:00 pm – AUDITION CALL BACKS FOR CHARACTERS. This session will be by invitation only. Please keep your calendar clear. We will let you know by Wednesday who is needed for this session. Theatre students – if you are interested in seeing 42nd Street at the Fulton, read on! This Thursday night is the next Teen Lounge session – and if you sold 50 apple dumplings – you are eligible to attend. This is a conflict for anyone attending the state conference – but there are 7 more tickets remaining! Stop by room 209 or send an email to Mrs. Mintzer to sign up. Workshop starts at 5:15, and then the show is at 7:30. You must provide your own transportation – but the tickets are FREE! First come, first serve basis.